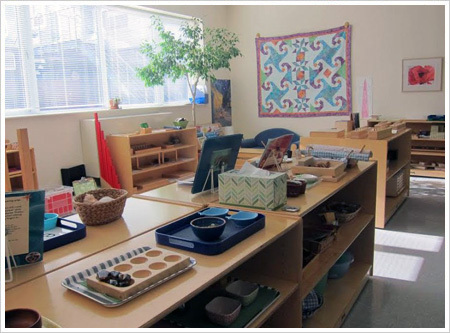 Carrig Montessori School is a traditional Montessori preschool, pre-k, and kindergarten located in East Williamsburg, Brooklyn. Children ages 3, 4, and 5 are offered 5 day programs from 8:30am to 1pm, 3pm, or as late as 6pm with our Extended Day option. A summer program is available allowing for enrichment year-round. Owned and operated by local parents since 2009, we are committed to providing high quality Montessori education at an affordable price. Our tuition reflects a true desire to serve the community and remain accessible to families in the neighborhood. Our space is comprised of two classrooms, equal in size, allowing for a total enrollment of 40 children. Student-teacher ratio is 1 teacher per 7 students. Outdoor play space includes a private patio and the playgrounds at Cooper Park, located directly across the street. Below are just a few of the reasons why CMS is considered one of the best schools in the area. Carrig Montessori School is located on Olive Street, a quiet single-lane road far removed from the major highways and thoroughfares that can overshadow city life. The school's many windows look out toward the recently renovated Cooper Park, one of the neighborhood’s few open spaces. While primarily used for daily trips to the playground, it is here where CMS families gather for the school’s picnics and year-end celebrations. When each school day comes to an end, families picking up from CMS will often find one another at the park's playgrounds for impromptu playdates, further strengthening the unique sense of community found at the school. Despite this peaceful setting, CMS remains a short walk from the many stores and cafes that surround the Graham Avenue stop on the L.
While many families walk or bike to school, those that drive will find ample street parking and easy access to Bushwick, McGuinness, Metropolitan, and the BQE. A strong relationship between parents and teachers is an essential part of any preschool experience. At CMS, frequent communication will take place by phone, e-mail, and at pick up and drop off. A photo rich parents-only blog keeps CMS familes updated on the latest happenings in the classroom. Twice a year, parents are invited to formal classroom observations, followed by parent-teacher conferences. All head teachers hold or are working toward a Master's Degree in Education and are trained in Montessori education. Teachers at CMS, many of whom live in the neighborhood, are hired not only for their qualifications but also their commitment to educating the whole child. CMS believes that the dedication and enthusiasm of teachers is reflected in the success and happiness of the students.